2 medium sized potatoes, cubed. 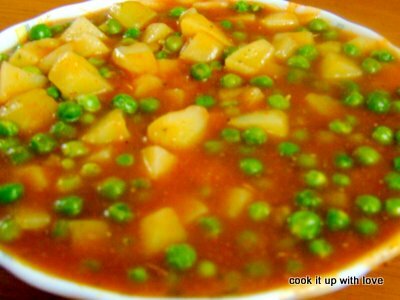 Cook ( I always steam) the potatoes and peas with a pinch of salt and set aside. Make a paste out of tomatoes, onions, ginger and green chillies. In a pan, heat the oil, and add curry leaves,garam masala & jeera powder, saute for a while. Pour the paste, let it simmer for around 5 minutes, till the gravy thickens a bit. Add salt and red chilly powder, mix well. Finally add the steamed veggies and let it soak in the gravy for a while. This entry was posted in Great Gravies . Bookmark the permalink.